Our Milky Way galaxy is a messy eater, leaving streams of star "crumbs" spread across the sky after chomping its smaller neighbors, a new study reports. Astronomers have found two such streams emanating from the Sagittarius dwarf galaxy, torn off by the Milky Way's huge gravitational pull. The two newfound star tails are in the southern galactic hemisphere, and they meet up with two others previously known from Sagittarius in the northern galactic hemisphere. "Sagittarius is like a beast with four tails," study co-author Wyn Evans, of the University of Cambridge in the United Kingdom, said in a statement. Before the new study, Sagittarius was known to have two tails, both in the northern galactic sky. In 2006, astronomers noticed that one of these tails was forked in two. "That was an amazing discovery," said lead author Vasily Belokurov, also of the University of Cambridge. "But the remaining piece of the puzzle, the structure in the south, was missing until now." To solve the puzzle, Belokuroz and his team analyzed data from the latest Sloan Digital Sky Survey (known as SDSS-III), which uses an 8.2-foot (2.5-meter) telescope in New Mexico to scan the heavens. The researchers looked at maps of more than 13 million stars, eventually spotting the two new star streams branching off from Sagittarius. One stream is fatter and brighter than the other, and it's more enriched with iron and other metals than its dimmer companion, researchers said. Because each succeeding generation of stars produces and distributes more metals than the last, the team concluded that the brighter stream is younger than the fainter one. The team submitted its findings to the Astrophysical Journal, and posted its study on the physics and astronomy site arXiv Nov. 30. The researchers aren't sure what caused the galaxy's star tails to split. One possibility, they said, is that Sagittarius was once part of a binary galactic system, like the present-day Small and Large Magellanic Clouds. Sagittarius and its putative partner could each have generated a leading and trailing tail upon falling into the Milky Way, yielding four streams in total. A collision with a massive clump of dark matter or another satellite galaxy could also have split each of the streams into two, researchers said. Finally, another theory posits that debris from the chomped-on Sagittarius may have simply spread into different streams at different points in time, the result of different epochs having different patterns of galactic wobble and movement. 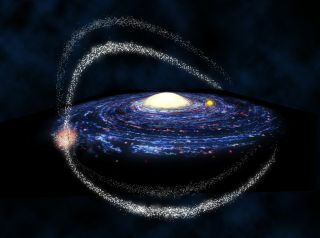 However the streams took their final shape, researchers said, they provide further evidence that our Milky Way galaxy has devoured up a number of its smaller neighbors that strayed too close.